Nigellissima is one of my favourite cookbooks and I’d certainly recommend it. I enjoyed this recipe, the amaretti biscuits in the crumble mix up the old favourite that you’ve eaten all your life, but be careful not to go too overboard with the lemon. I also added blackberries to Nigella’s recipe because they are just too good looking to resist when I see them in a shop, but I still haven’t a clue what to do with them when I get them home. They need a home somewhere and crumble is a forgiving place. First things first, bash your lovely amaretti biscuits into a powdery mess to get them to ready for your crumble. Place in a couple of freezer bags and bash with a rolling pin (if you’re a well prepared cook) or a wine bottle (if you’re me). 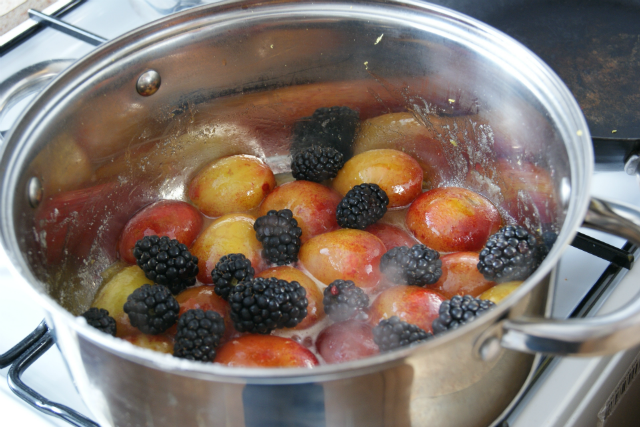 Pop your butter, plums, blackberries, sugar and lemony items in a pan and start to melt together. Cook for two minutes without the pan lid, then another two minutes with it on. Once your fruit is of a standard your grannie would be proud of, tip them into a overproof pie dish (about 23cm by 6cm deep). 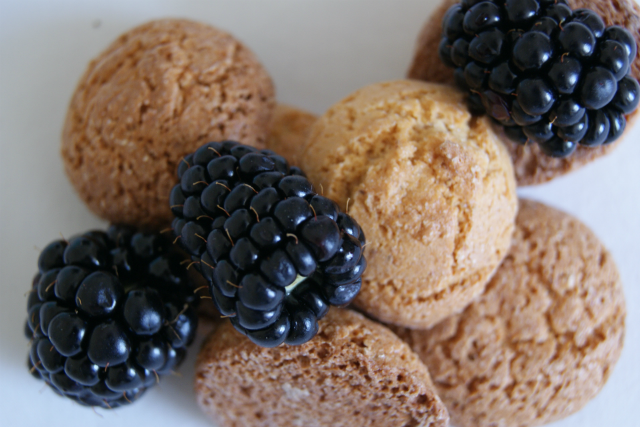 Nigella recommends sprinkling some of your amaretti crumbs, straight to the fruit (about 2 tablespoons worth). 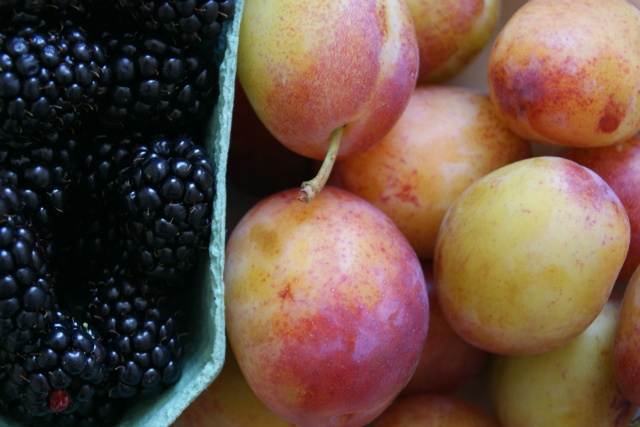 Now turn your attention to your crumble. Mix up your flour, baking powder and cold butter cubes in a bowl. You could use a mixer for this, but I’m traditional so I went for the ‘rub your fingers through the mixture ’til it looks crumbly’ technique. Once you’re happy with that, add in the sugar and the rest of your amaretti crumbs. Next up is the grand construction. 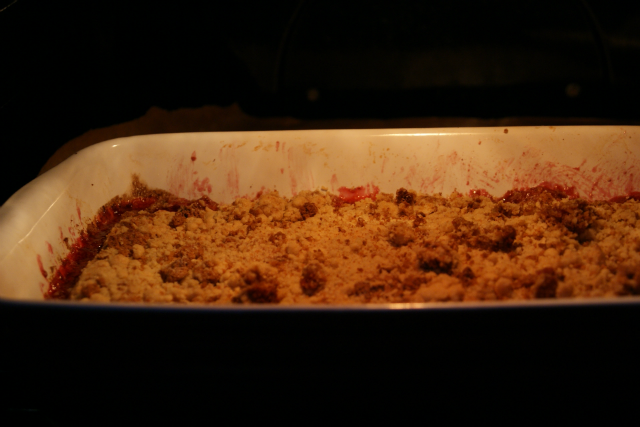 Sprinkle your crumble onto your fruit, covering evenly across the top to avoid too much fruity leakage. Don’t go overboard with getting this too perfect though. I think I was a bit too careful at the start and the photo below shows the evidence of my frantic scratching round the edge of the dish later on trying to get some of that fruitiness bubbling up. Place your creation in the oven on 190c or gas mark 5 for thirty minutes until it’s nice and golden and the fruit is bubbling. 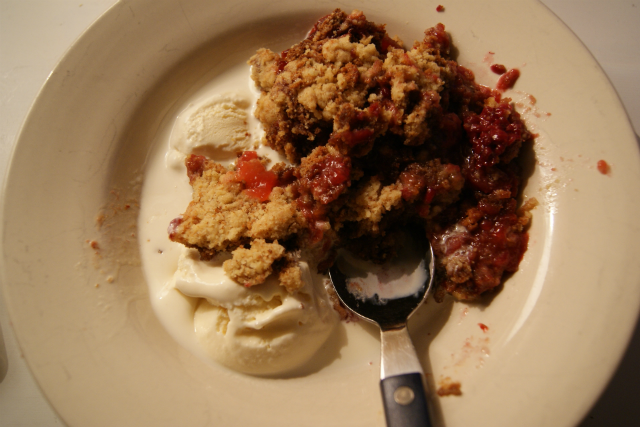 Add in your favourite crumble accompaniment (I was an ice cream girl this time) and enjoy.